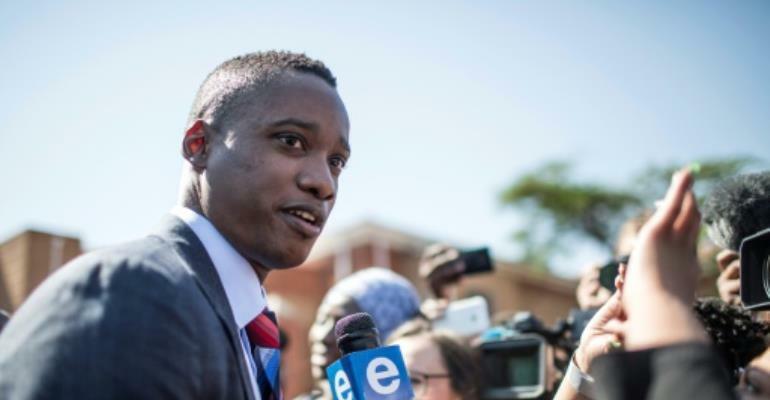 Duduzane Zuma, son of South Africa's former president Jacob Zuma, has pleaded not guilty to manslaughter over a fatal late-night car crash in 2014, a court heard Tuesday. He went on trial at the Randburg Magistrates' Court in Johannesburg accused of causing the death of Phumzile Dube after his Porsche hit a minibus she was travelling in. Three others were injured and one passenger, Nankie Mashaba, died in hospital weeks later. Prosecutors withdrew a manslaughter charge, known as "culpable homicide" in South Africa, related to Mashaba's death. "Duduzane Zuma has pleaded not guilty to a charge of culpable homicide," reported the Eyewitness News site. In a separate case, Zuma, aged in his mid 30s, faces corruption charges over allegations of a bribe offered to former deputy finance minister Mcebisi Jonas. Jacob Zuma, 76, was forced to resign in February 2018 over allegations centring around the Gupta business family, who reportedly held such sway that they picked cabinet ministers. Duduzane Zuma was previously employed by the Guptas. Jacob Zuma, who has five wives and at least 20 children, has also been charged with 16 counts of graft linked to an arms deal from before he became president.